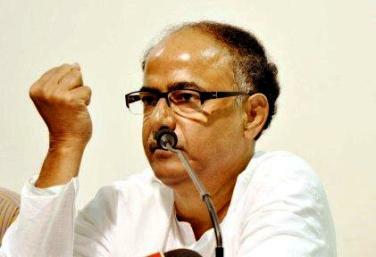 Housing minister in the previous West Bengal government, Gautam Deb, is credited with creating New Town in Rajarhat or Jyoti Basu Nagar, a planned township spread over 7,000 acres in West Bengal, a state now showing the way for land acquisition agitations. In an interview with Business Standard, the star campaigner from the Communist Party of India-Marxist discusses the reasons behind the party's rout and the policies of the new government led by Mamata Banerjee. What went wrong with the Left Front in the Assembly elections? After winning 28 elections at a stretch from 1977 Parliament, Assembly, Panchayat 2009 saw a break. Apart from all the positive achievements for which the Left Front has been in power for so long, some weaknesses undoubtedly crept in and were compounded in the last leg of its tenure. Some specific developments, for example, the land issue at Singur and Nandigram, and the police firing at Nandigram, coupled with the government's inadequate performance on some of the issues that directly affect the poorest of the poor, tribals and minorities, took a toll. There was also, the political factor to be considered when all anti-Left forces came together in a form that was not evident in earlier elections and cost the Left the elections. 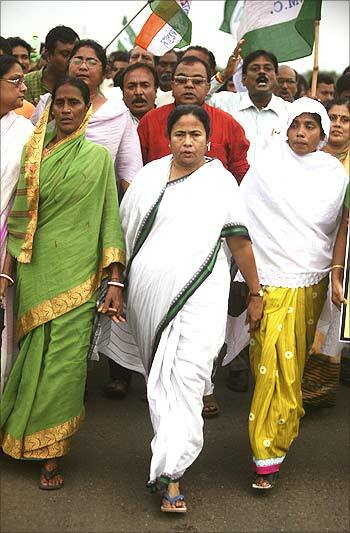 Image: Mamata Banerjee takes part in a protest rally in Singur. 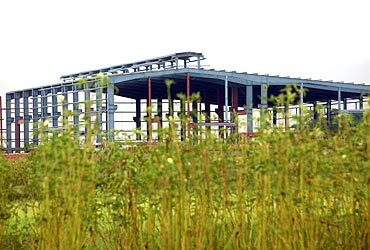 Is Bengal unprepared for industrialisation? Without land, industrialisation is a utopian concept. When enormous tracts of land were mobilised in Haldia during Jyoti Basu's time, some villages had to be relocated, which was not the case in Singur. Land was required for Indian Oil Corporation, Haldia Petrochemicals and many other big companies that constitute Haldia. It had an impact on elections even then. We lost the seat in the Assembly and the municipal elections, but we made a point to the rest of Bengal that the move was imperative. People were aggrieved temporarily. We rehabilitated those villagers in a proper way, and when standards of living improved, they felt the transformation and the issue died a natural death. Likewise, we will be able to show them that we mean business and it's good for them. Image: Tata Motors security personnel and policemen stand guard at Singur factory. Why could this model not be replicated in Singur? Unfortunately, this time 85 per cent of land owners gave their consent to this project, but unlike Haldia the issue was taken up politically. This was the fundamental difference. It was not a peasant struggle. It was a political struggle lodged by a party with an agenda. Image: The abandoned plant of Tata's Nano in Singur. How did you manage to acquire such large tracts of land in Rajarhat? Rajarhat was done very quietly with the help of all political parties. From the very outset I took political parties into confidence and formed a land procurement committee. They were authorised to demarcate the boundary and determine the compensation in each and every mouza keeping the prevailing rates in mind. They proposed an enhancement of rates. Each and every recommendation was accepted by the government. I got the cooperation of farmers and they were involved in the unskilled part of the supply mechanism. 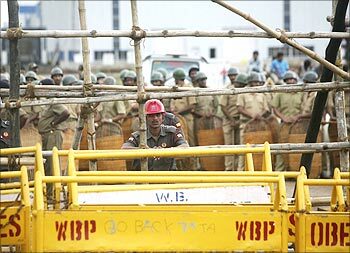 They were given training at the cost of the West Bengal Housing Infrastructure Development Corporation Ltd. Moreover, for the first 10 years of our tenure, there was no intervention from the opposition. 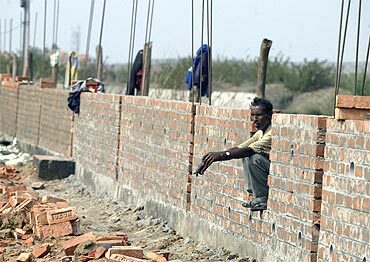 Image: A farmer at a construction site in Singur. 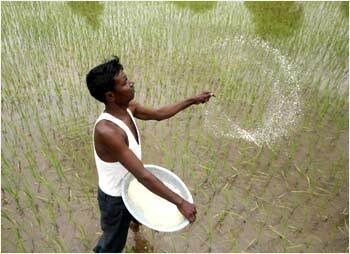 Should land be returned to unwilling farmers at Singur? We acquired land for industry. If the government returns land in one case, how will it deal with demands in other cases? Anyone can ask for his or her land. For example, in the case of the Katwa thermal power project, the project could not start because all the land could not be acquired because of opposition from the Trinamool Congress when it was in the opposition. However, some land was acquired by the earlier government for the project. So if farmers now want the land back will it be given back? Even the government of India is not contemplating utopian things like returning land to farmers in the new land Bill. Or, for that matter, what Mamata Banerjee is now advocating -- that not a square inch of land is to be acquired. Even someone like Vinobha Bhave could not mobilise much land from the public during the Bhoodan movement. That's why the sovereign power is with the government. The basic questions are compensation and rehabilitation. Imagine what will happen to Bengal if no land is acquired for power projects. It was a power-surplus state for the last 20 years, but there is an estimate that in the coming year the shortfall will be around 1,200 Mw. How will it be mitigated if Mamata Banerjee does not take up at least a couple of power projects? Bengal will be in deep trouble. Image: Mamata Banerjee takes part in a rally in Singur. With your experience in land acquisition will you go back on industrialisation? We will stick to industrialisation. Surprise visits to hospitals are good, but Mamata Banerjee will have to do more. She will have to create employment, add value to agricultural products and bring investors. Without infrastructure no investor will come. Unlike her, we will cooperate on good projects. 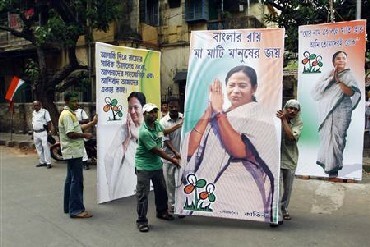 Image: TMC supporters carry Mamata Banerjee's cutouts. What do you think of the Singur Bill? The Singur Bill will create a lot of problems. It will completely mess up things in the state. Do you think the Bill will affect investor confidence? A single Bill will not hamper investor confidence, but the message that has gone out is very wrong. The agreement with an industrialist of RatanTata's stature was cancelled without any discussion. She is showing the strength of the Assembly. The agreement was cancelled arbitrarily, so any investor will think twice before coming here. More so after the recommendations of the land committee submitted recently, industrialisation will become difficult. It suggests that no land will be mobilised by the government. The whole country is there, investors don't have any compulsion to come to Bengal. It is completely anti-industry and not pro-farmer either. 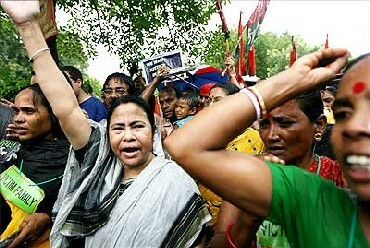 She is a victim of her slogan Ma-Mati-Manush.